Foundation, grading / drainage, roof , attic, interior & exterior walls, ceilings, floors, doors, windows, fireplace/chimney, porches, decks, carports. Service entrance, Circuit breaker panels, branch circuits, and wiring. Water supply and fixtures, waste drains, vents, water heating equipment, hydro therapy equipment. Dishwasher, Disposal, Range, Hood, Microwave oven, Trash compactor, Bathroom exhaust fan, Garage door, door bell and chimes, dryer vents. , TXAverage inspections take 3-4 hours. Clients are welcome during this time, however, we recommend being there for the last hour ,so that, we can spend more time with you, doing one last overall inspection and allowing us to address any obvious or general issues with client . Inspectors do not give ,on the spot, final opinions. It is not until all information is evaluated and combined in a written report can we make an accurate, educated opinion of the facts that you can rely on. 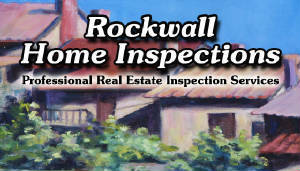 Use Rockwall Home Inspection ! Rockwall / Dallas / Fort Worth area. Reports can be printed, faxed , or e-mailed. 24/7 Message center to schedule inspections. Use The Best ! Use Rockwall Home Inspections ! Rockwall Home Inspections , inc. Rockwall, Texas, 75032, 972-772-6050, Listed in the phone book and on the web as " Rockwall Home Inspections ". Its our company name, where we are locted, and what we do ! We inspect homes in the entire Dallas / Fort Worth and surrounding area covering a 50 mile radius...call us , we will be there for you.